Injuries you incur or illnesses you contract while on the job or while on company business can be handled through a worker’s compensation claim. Whether it is a fall on company property, an injury from defective equipment or machinery, a long term repetitive injury, or even an illness resulting from exposure (occupational disease) you may need representation from an attorney to handle your worker’s compensation claim against your employer. Your employer does not need to be found at fault for you to receive benefits; however, you may disagree with your employer about how extensive those benefits should be. 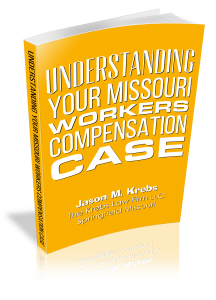 When you feel you are entitled to more compensation, please call a Missouri workers compensation attorney. Notify your employer in writing of your injury within 30 days recording all details regarding the date, time and location along with the nature of the injury. Failure to report your injury within 30 days can jeopardize your chance for benefits. As with all injury cases, be sure you go to the doctor and follow the recommended treatment. Your employer will pay for the medical care; however, your employer chooses the doctor. Your employer may feel you should no longer need medical care or do not need long term disability. If you disagree, call The Krebs Law Firm to handle your workman’s comp claim. Have your injuries kept you from working for at least a year? If so, you may also have a Social Security Disability claim. We can help you with both and will explore all legal options to get you compensation for medical expenses and lost wages. The Krebs Law Firm can help with your worker’s compensation case. I am tired of seeing good people being short changed by lawyers with clever advertising who are giving a bad name to great attorneys who are true advocates for the clients. We want to show you how you can find the best attorney for your case at no additional expense to you. I hate to see insurance companies and employers take advantage of injured workers who don’t know their rights. Absolutely not. This is not a solicitation for your Missouri Work Comp case. We spend a lot of time speaking with and giving guidance to people who contact our firm for general advice and guidance in injury and disability cases. This free book is simply a way for you to get important information to read in the comfort of your home, and without the anxiety that may come with contacting a lawyer directly.